Looking to declutter and make some money? Book a stall at the Mum2Mum market! Sell your quality second hand baby, children’s and maternity clothes, preloved baby equipment or used pram at the nearly new baby and children’s market and keep 100% of the proceeds. Don’t worry if you haven’t sold before – we will guide you through the process with our sellers’ tips to help you get the pricing and presentation right so you maximise your sales on the day. This entry was posted in Get Involved / Have Your Say, Mar and tagged calderdale, Get Involved, March, Market, Mum 2 Mum, Sowerby Bridge High School, Stalls. This entry was posted in Get Involved / Have Your Say, Mar and tagged calderdale, Event, Get Involved, Halifax, March, Market, Mum 2 Mum, Sale, Sowerby Bridge, Sowerby Bridge High School. The Yorkshire Victorian Christmas Festival & Market recreates a Dickensian Christmas in Brighouse, with a huge street market full of Xmas gifts, shops decorated in Victorian style and staff dressed in period costume. Join the festivities on 26 and 27 November in Brighouse. Street entertainers, choirs, brass bands, parades, street food and a funfair will entertain you as you shop. Watch out for Santa parading in his horse drawn carriage. Try the wonderful street food, enjoy a glass of mulled wine and take the kids to Santa’s grotto or the funfair. This entry was posted in Brighouse, Get Involved / Have Your Say, Nov and tagged calderdale, Christmas, Entertainment, Events, food, Get Involved, Market, November, Santa, Stalls. 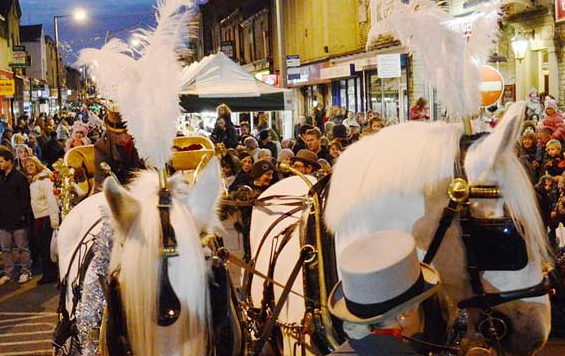 Brighouse town steps back to the Victorian era with carol singers, street entertainers, mulled wine, roast chestnuts and a horse drawn carriage. It is the perfect opportunity for Christmas shopping with over 80 stalls of locally produced food and crafts at the Christmas Market. This entry was posted in Brighouse, Get Involved / Have Your Say, Nov and tagged Christmas, Event, Get Involved, Market, November.